"​Our dear sweet baby Andy. He always wanted to be a good dog. He always wanted us to be happy. We will miss him so much. 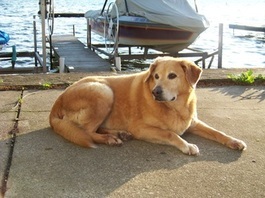 Dear Andy, you are with your brothers Buster, Chippy, and Mueschke, and sister, Lucky, now. I hope you are all having fun in Heaven. We can’t wait to see you all again." The picture of Andy with a bow tie was from the day his parents renewed their wedding vows for their 25th wedding anniversary. He was up at the alter with them. Libby was adopted from N.A.B.S. and she traveled with her family. This is the picture they have in a frame in their living room. They love her so much!!! She still lives in their hearts. She was a very happy dog! 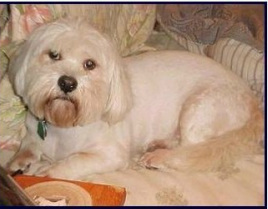 A couple of years ago, Pam called me and asked of I would be willing to foster a little dog named Douglas. 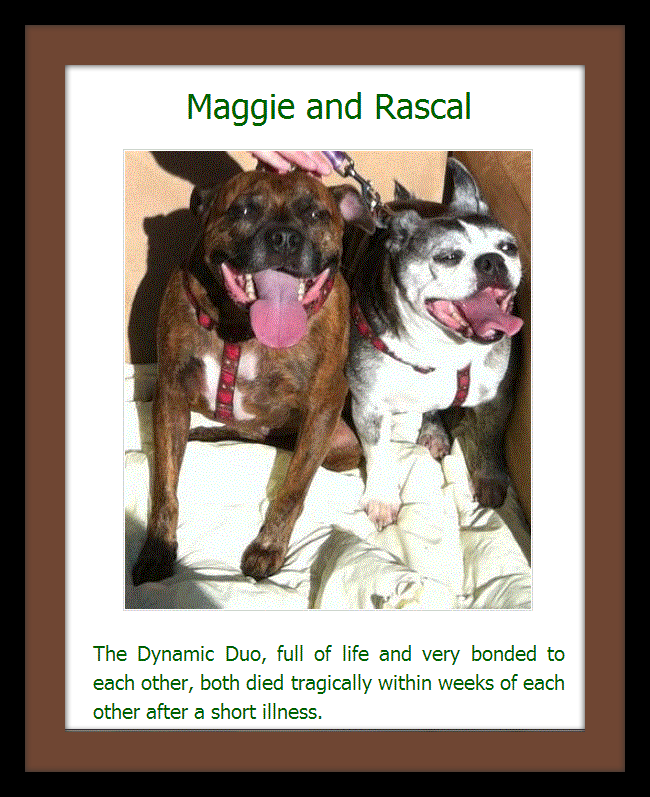 He had a serious heart problem and some skin problems and Pam thought he'd do better in a home. I said yes and drove down to get him. When Pam handed him to me I knew that I'd have to adopt him and so I did. He was so sweet and adorable. 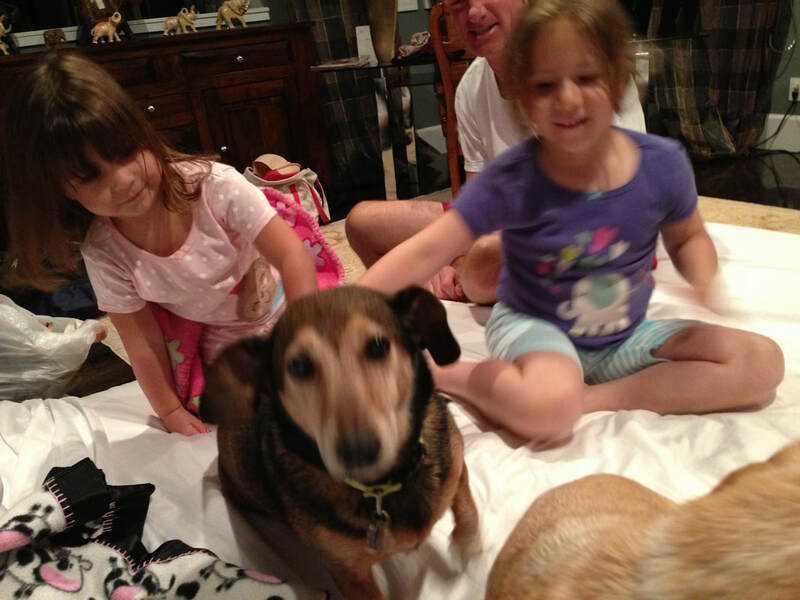 He soon became a favorite of our family and friends. Even though he was very sick, you would never know it. When it was time to eat he'd get so excited he'd do a little dance. I called it his Earl Campbell dance. After we went out for the last time at night, he'd hop like a bunny to the pantry to get his bone. He was a quiet guy and slept in his bed or curled up next to me on the sofa. He loved for our daughters to come visit with their families. When it was time to go to bed with us at night he run to the bedroom and hop up and down until I put him on the bed. If I didn't get in bed right away he'd bark until I came to bed. There are so many sweet memories of Douglas. He was a little angel. We called Dougie bug or baby boy. We miss you Dougie bug and we will never forget you. Austin was 12 1/2 yrs. old and was loved by his family Jason & Angie Lee and children and all at N.A.B.S. Sadie is loved and missed very, very much. She was adopted from N.A.B.S. by Flo Darnell. Emma was Jan Curry's best friend and love. She may be gone, but will never be forgotten. DONATION IN LOVING MEMORY OF GRAYCE RUNDELL. She was a beautiful little girl and a blessing from God. This picture is by no means a recent one, but it's one of our all-time favorites and how we imagine he's spending his time at the Rainbow Bridge. Ricca will be greatly missed by everyone who knew her including Nancy "Grammy" Nelson, Traci, and Jerry Nelson, Jr. May she rest in peace. taken a few months earlier. Here's one young man who will always remember his Roxy Girl! When he has become an old man, many, many years from now, when we are all gone, he will still remember his first love. Miss Pam and Old Axel. 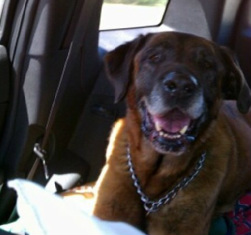 Axel has now gone over The Rainbow Bridge. You will be missed but not forgotten, old man. 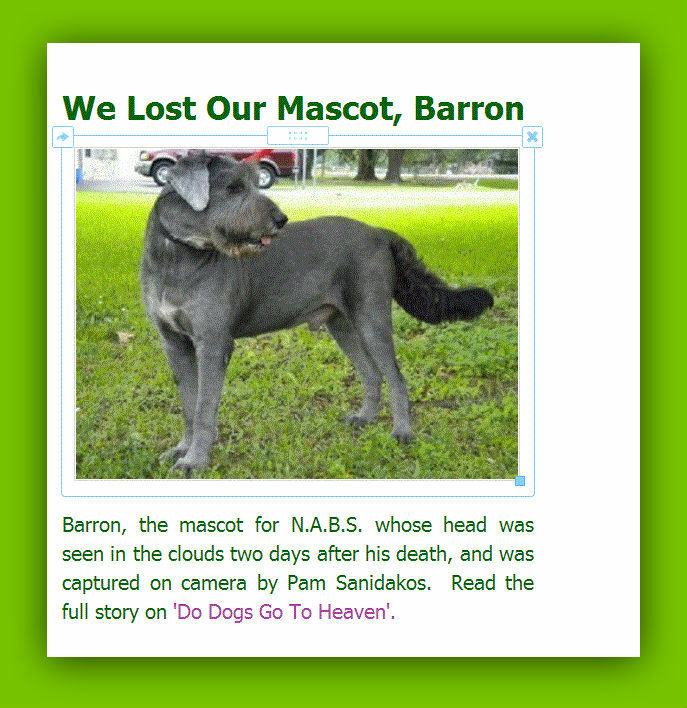 Read the full story on 'Do Dogs Go To Heaven'. Cowgirl 1988-2006 Eighteen years! Goodnight sweet girl. We will see you again! I adopted Roxy from you. She was such an incredible friend. I loved her so much. She was my favorite. She passed away last summer. She died from kidney failure. 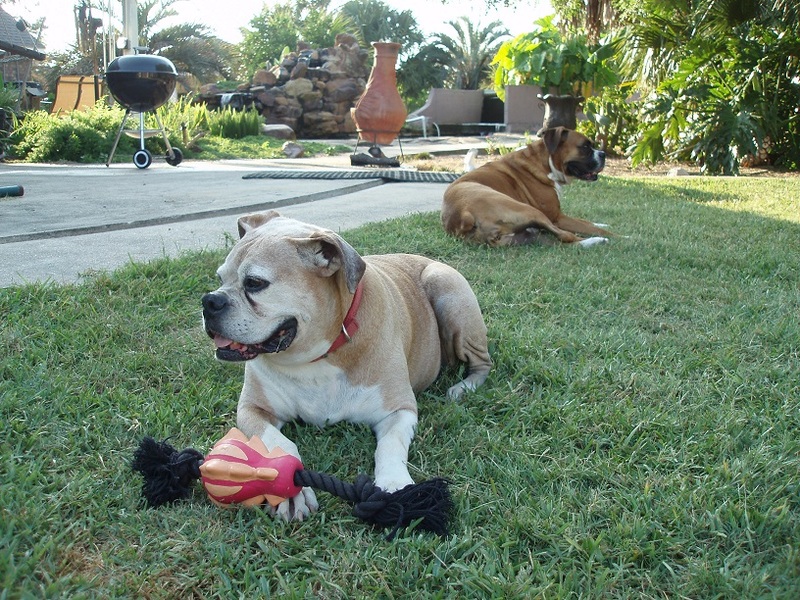 We tried everything to help her and her kidneys just would not function. Her body gave out but her spirit just did not want to leave up until the end. We took her to Florida for her a month. She loved the beach and we took her to the beach every day. She loved to chase the crabs. She forgot she was so sick while she was on the beach. She was so full of love. She was smart, beautiful and had a great sense of humor. This donation is in her memory. Pam S tricked Pam C by calling and saying, "I have this Boxer I want you to look at and see what you think of her." I knew it was a trap because I am partial to Boxers. So I said, "No! I don't want to see her. Don't bring it over here!" "OH! I'm sitting in your driveway right now!" I immediately caved, "I'll be right out." and that's how we got Dutchess. I trained her for my daddy and gave her to him. I thought she would go first, but like the lady she is, she waited for him to go ahead of her. She lived another 2 years with us. When God called her name, she dropped instantly to the earth and was gone. She had been just fine all day then at His word, she ran to meet her Master. Your loving and joyous spirits will remain in our hearts and minds forever. We love and miss you both. You died before your time. Thank you for all the wonderful memories! 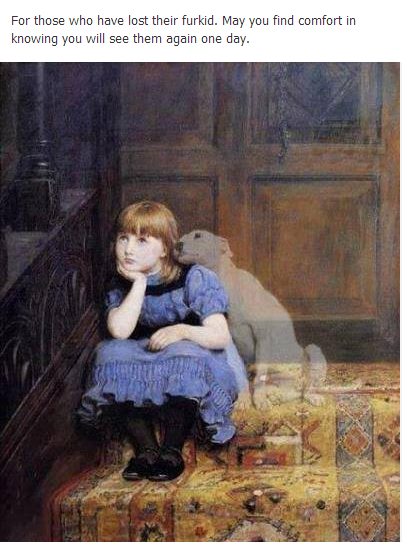 Pam Sanidako's much loved Doogie. 2000-2006. 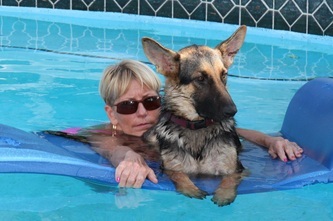 Pam Cundiff with her beloved Tsunami who was killed in a freak accident. The good die young. Samantha Jean, best friend of Dan Bonis, only death could keep her away. 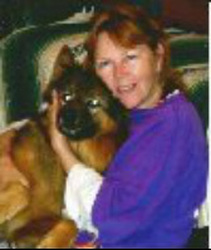 Gaye Hart and her furchild Rusty. Rusty's brother Ripper. 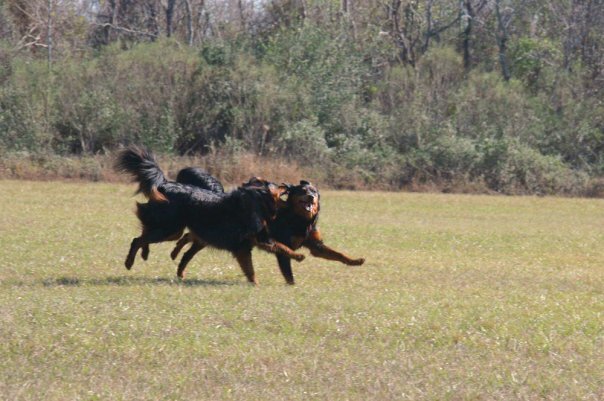 Ripper and Rusty, brothers, passed just 24 days apart. 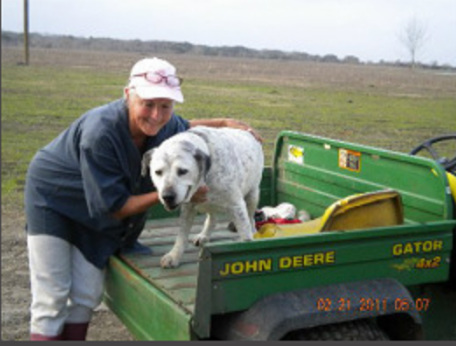 Both belonged to our own beloved Gaye Hart, pictured left with Rusty. Anthony with his favorite puppy. 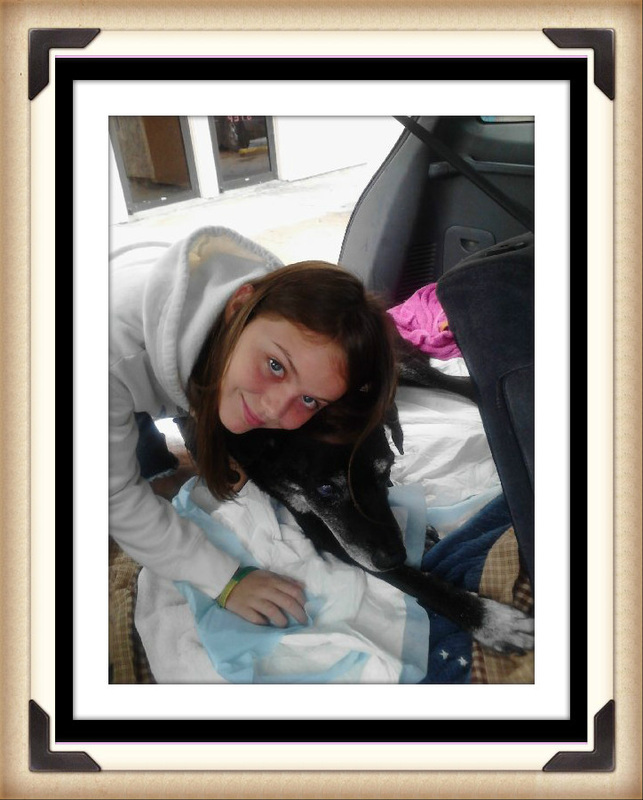 Andy, black dog wrapped in the blanket with 'niece' Brandi on the way to the vet for the last time. 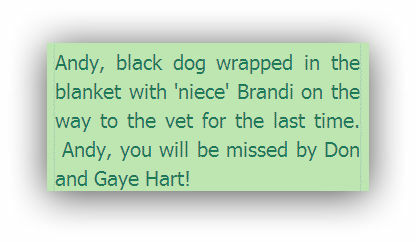 Andy, you will be missed by Don and Gaye Hart!